Mental health services are being “starved of resources”, the chairman of a health watchdog in Norfolk has said. 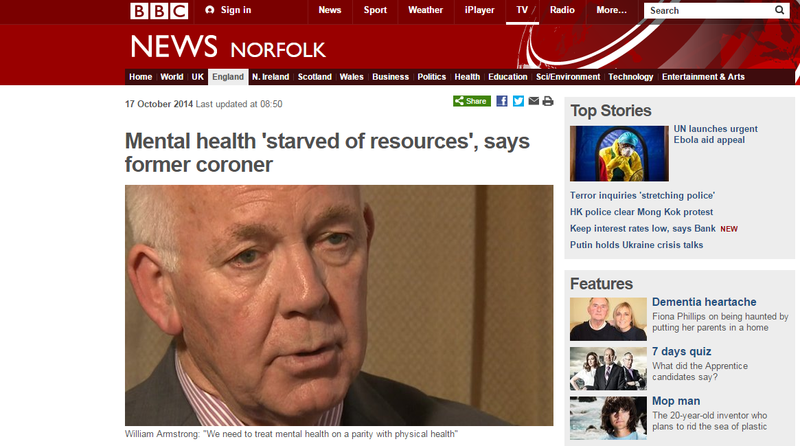 Ex-coroner William Armstrong, of Healthwatch Norfolk, said cuts meant “more misery” for patients and their families. He said he had seen a “fragmented and uncoordinated” approach to mental health during his time as a coroner. Mr Armstrong told BBC Look East: “Mental health services are being starved of resources given to other parts of the health system. We need to treat mental health on a parity with physical health. He said the lack of cash meant more people with mental health conditions would not be diagnosed, leading to “more misery for them and their families”. Mr Armstrong said the number of people killing themselves when suffering from mental health conditions could be reduced with the “right specialised treatment by the right people”. Norfolk and Suffolk NHS Foundation Trust, which treats mental health patients, said it was “deeply saddened” by Mr Dunham’s death but would not comment further. Perhaps NSFT’s silence is because it is getting sued by families of those it has let down? Or because NSFT only chooses to talk about ‘good news’? Where is duplicitous ‘mental health champion’ Norman Lamb, the local MP and Minister of State at the Department of Health directly responsible for mental health? Nowhere to be seen. That’s something at least. My Brother has been cared for by the outreach mental health support team. He’s been schizophrenic for 30 years. Found dead recently in his flat. Filthy, insanitary conditions. Died of pneumonia. I need to complain and have a full enquiry into what appears to be a serious multi agency failing. I’m looking for support and help in having my complaint dealt with properly. I have no trust in this trust, the history of poor practice is awful. I’ve never felt in a position to complain before, I always thought it would impair the care delivered to him. Please contact me for a full description.